"The two men met privately in Cameron's office. Not only was Davis assured he could keep his job as shadow home secretary, Cameron even agreed to his rival's request to shelve plans to downgrade the classification of the drug ecstasy." In agreeing with Mr Davis on this issue Mr Cameron has avoided a potentially very disruptive row. He is also starting to fulfil his hustings promise to decide drugs policy by collective shadow cabinet agreement. Mr Davis was a strong opponent of Mr Blunkett's 2003 decision to downgrade cannabis and he will pressurise Mr Cameron to support Tony Blair's upgrading of the drug. Without that support the Tories will face the kind of attacks that The Sun aimed at the LibDems during the last election. Soft on drugs and soft on terror could otherwise become a major weapon in Labour's currently uncertain attempts to curtail the Cameron honeymoon. If true it will stop it becoming an issue. Its not a priority, it will be like fox hunting is for Blair. He uses it as a sop to his class warriors every now and then. Something of interest to social Conservatives and libertarian Tories but not a big issue to the voters at large. The leaders of the Danish research team have explicitly said that their study doesn't show any causal link between cannabis and schizophrenia. It might hurry things along, but even that is conjecture. Still, anything for cheap politics. Never mind that teenagers in Portugal and Holland (most liberal laws in Europe) use drugs far less than ours. Or that countries who implement politically motivated crackdowns usually see a huge leap in drug death rates soon afterwards - eg Sweden's has doubled in a decade. Hasn't Rosie Boycott changed her mind on this one? Good show! This is more like it. Davis and Cameron pulling together gives the impression of a Goverment in waiting. I agree with Clare Lewis above. David Davis needs to step in with his differing views and experience to make sure that David Cameron doesn't do anything stupid. It would seem then as if David Cameron is sticking to his promise of working with his Shadow Cabinet to decide party policy – which is good news. However, as Guido says, it isn’t really an issue at large and will only be important to those who are either very much for or against it. The question which remains though is what will party policy be regarding cannabis? 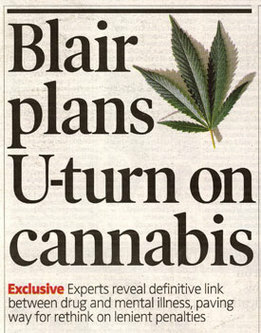 Will David Cameron support Tony Blair’s wish to upgrade the status of the drug? Does not Michael Gove take a Giuliani-style approach to crime? The meeting was actually in DD's office. But let not that minor detail detract from the "substance"! When does DC get privvy councillor status? This is good news. Let's hope DC continues to rely heavily on his more sensible colleagues! I think we got a hint during the leadership contest that he was backtracking on cannabis anyway. He said that drugs policy would be decided by the shadow cabinet. This was a clever way of doing a U-turn without admitting it(and also without spoiling his liberal credentials). It's a pity the debate has to be framed in this way though: "cannabis does damage health therefore it's been upgraded." Shows no recognition of the fact that those who argue for decriminalisation are in no way denying the effects of the drug, but rather debating about the most effective way of controlling it and treating its effects. The debate is not whether cannabis is harmful to health, of course it is, the debate is whether prohibition is really the best way of tackling it.